Let Us Make Your Home Beautiful With the Best Replacement Windows! Whether you are looking to renovate each window in your home or simply replaced that one that gives you trouble, Renewal by Andersen of St. Louis has you covered. Our team of factory-trained experts has worked closely with thousands of homeowners in the St. Louis area, putting together window replacement projects that lead to more beautiful, energy efficient, valuable homes. 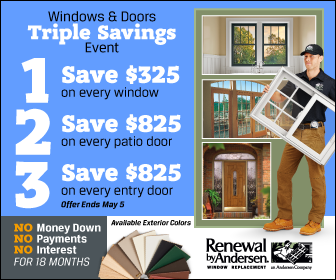 Nationally, Renewal by Andersen has replaced more than two million windows in more than 300,000 homes. “Value” is the key word in the services we provide here at Renewal by Andersen of St. Louis. The replacement windows we install add deep, lasting value in the form of increased energy efficiency, ease of maintenance, and aesthetic appeal. There is even value in the Renewal by Andersen name. Andersen products and patents have revolutionized the window and door industry for more than 100 years, changing the home construction industry, how homes are designed, and even how we live in our homes. Whether you are trying to sell your home and want to improve on your return or you are just trying to create a better home for you and your family, installing Renewal by Andersen windows is the perfect first step. Don’t wait to take that first step. Get started on your home improvements today by calling Renewal by Andersen of St. Louis or filling out our Request an Estimate form to schedule a FREE in-home consultation with our St. Louis replacement windows experts. Turn to Renewal by Andersen® of St. Louis for windows and you will choose from the widest selection of high quality replacement window styles on the market today.